The PSX64 interface connects Playstation controllers to computers that use a DB9 port and Commodore 64 pin configuration (such as the Amiga, Atari 2600, Sega Master System, and many other 80′s systems). Additionally, if a guitar controller is detected, it will encode strum up, strum down, lift up, and the whammy bar onto the two potentiometer lines of the joystick port. While this extra guitar functionality is usable by the Shredz64 game only (and any future projects), the normal functionality of the PSX64 interface can be used with any game, and works well! 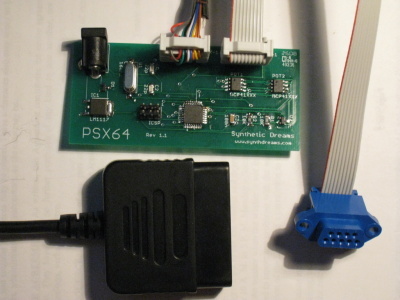 Purchase a PSX64 interface from Synthetic Dreams! 1. The aforementioned ability to hook a Playstation controller up to a DB9 joystick computer. It maps up, down, left, right and X on the PSX controller to up, down, left, right, and fire on the computer, respectively. If connected to a computer that supports 2 buttons, such as the Amiga or Sega Master System, square will be mapped as the second fire button. Circle and triangle will be configured as turbo buttons for X and square, respectively. 2. If the Playstation controller is put into analog mode, it will also map over the left analog control stick to the 4 up/down/left/right directions. 3. On a normal Playstation controller, if the start button is pressed, the PSX64 goes into programming mode. The user can then hit L1, L2, R1, or R2, and program up to 127 buttons in for a macro mapped to that button. Hitting start again ends programming mode and saves the macro. These macros are saved in the PSX64′s EEPROM and will be retained after power off. 4. When a controller is plugged in, the PSX64 increases sensitivity for ultra-precision gaming. 5. If a guitar is plugged in, the PSX64 goes into guitar mode and maps the fretboard buttons into up, down, left, right, and fire. It encodes strum up, strum down, and lift up into one of the pot lines. It encodes the value of the whammy bar into the other pot line. 6. ICSP port for uploading new firmware. Plans to build a PSX64 interface can be obtained here, the Atmega8 firmware here, and the newer Atmega168 firmware here.